We are a full-service, modern animal hospital offering the highest quality veterinary medicine in a pet-friendly atmosphere in Morris, IL. "We are family and we understand how each individual person thinks, which makes it easier for us to work together. It makes coming to work each day something to look forward to!" In addition to diagnostic and preventative services, our hospital is equipped with digital radiography, digital dental radiography, in-house labs, CO2 laser, endoscopy, laparoscopy, cold therapy laser, and therapeutic laser. We also offer TPLO/TTA surgery, orthopedics, laparoscopic-assisted gastropexy, and fracture repair. 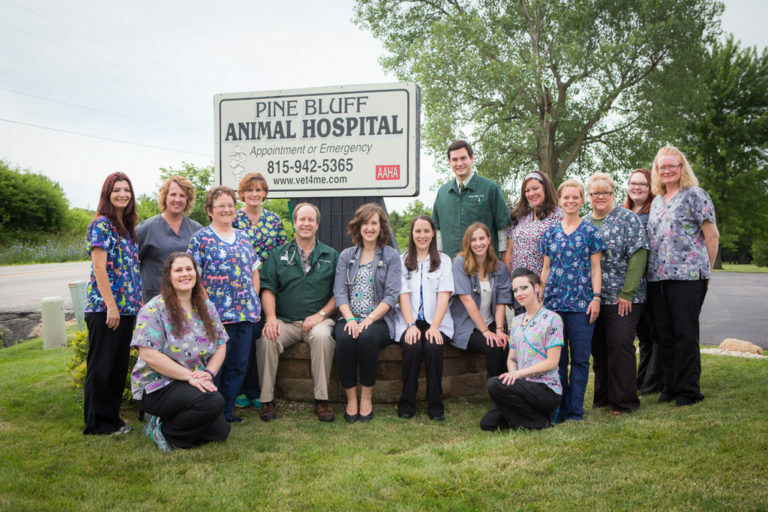 Recently, Pine Bluff Animal Hospital and Skinner Animal Clinic teamed up with Lurie’s Children, a pediatric specialty hospital, to make not only a difference in the lives of pets in our community, but also children. We held a nail trim event and, in total, our hospitals raised $900. That’s a lot of nail trims! We’re proud to call this town “home.” Offering the small town charm of a Norman Rockwell painting, our downtown offers a variety of shopping, dining and recreational activities. With a variety of festivals and markets, we are a gathering place throughout the year.